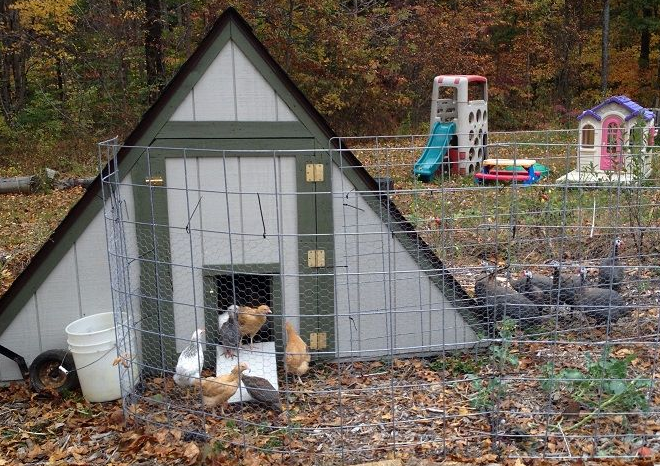 In fall of 2014 I decided I wanted to raise some dual-purpose chickens. The main focus was on incubating my own birds to raise as “panfrys”, traditional meat birds frequently used in pan frying. So let’s do some hatching. Spring was rocking and rolling. The nine hens were producing 6-7 eggs on average and it didn’t take me long to fill all 27 slots in my incubator. I had purchased an INCUVIEW incubator off a recommendation from TSP Podcast 1373. I really like this incubator as it’s almost “set it and forget”. Periodic checking the humidity and straightening the rows of eggs are all that’s needed. The last 10 days of my 5th run went unattended while we were on vacation. The Delaware/Buff mix produced a 74% hatch rate. Having never hatched chickens before we spend hours watching the chicks work their way out of the eggs. Then off to the brooder to be raised like the other meat birds. This part of my plan went smoothly. In fall of 2014 I decided I wanted to raise some dual-purpose chickens. The main focus was on incubating my own birds to raise as “panfrys”, traditional meat birds frequently used in pan frying. So I need some chickens. 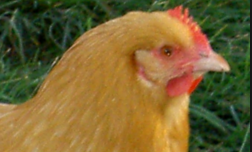 After doing some research, I decided to try 2 breeds, Delaware and Buff Orpington. I was really partial to the Delaware breed as they were initially bread to be a meet bird, but were quickly overshadowed by the current Cornish-X breeds. However, I’d raised some Buff Orpingtons the year before. I liked them so decided to try both. I purchased 4 hens and 2 roosters of each, along with 2 guinea hens that I also wanted for hatching eggs. That gave me 8 new layers, plus and extra leftover Buff hen from 2014. Having two of each rooster would allow me a chance to choose a well behaved rooster of either breed. By spring I had decided to keep a Delaware rooster based on having local resources to get more Buffs and the desire to really give the Delaware breed a try. In early spring, the guineas decided to gang up on a hen. Ganging up is apparently typical behavior for guineas, but given my limited number of hens, I was unwilling to risk losing birds so the young guineas became dinner. I local store also started carrying guinea chicks to replace our dwindling free range flock, so I wasn’t too concerned about not having eggs for hatching. So by the end of spring, I had my established flock, a Delaware rooster with 4 hens and 5 Buff hens. I was ready to hatch some eggs. In fall of 2014 I decided I wanted to raise some dual-purpose chickens. The main focus was on incubating my own birds to raise as “panfrys”, traditional meat birds frequently used in pan frying. So I needed a coop. 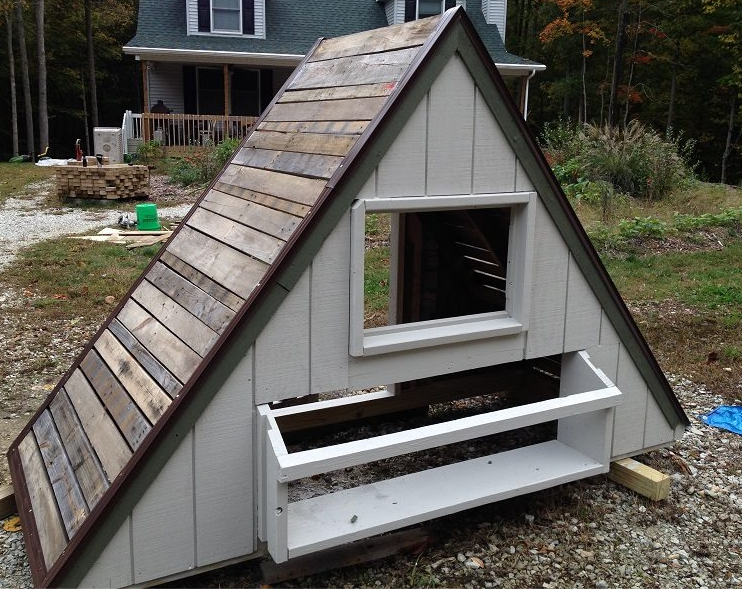 Using some pallets and leftover materials from my shed, I was able to build a nice A Frame coop for about $150. 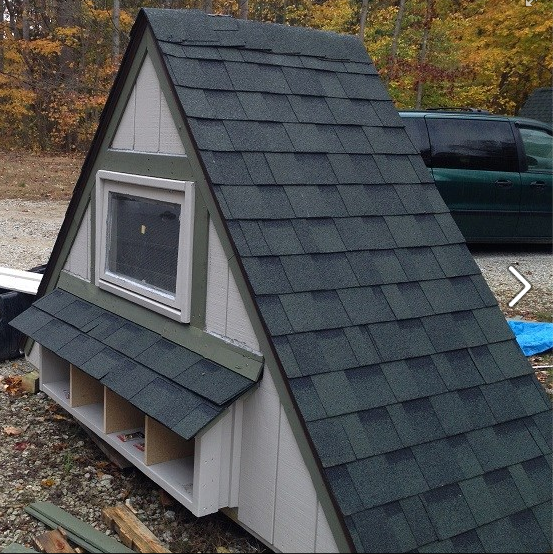 It has 4 nesting boxes in the rear with outside access and perching poles on either end. I wanted it to be fairly easy to move, but it’s really heavy. I guess that’s is good so it doesn’t blow over since it’s narrow. So far, the best way to move it is by dragging it across the ground after placing a “skid” under one side. I attached some extending wheels from the front of an old rider mower to one end, to the left of the bucket in the picture below. That helps to move it, but it’s still a chore best done with my compact tractor or the garden tractor. For Fencing, I started out using cattle panels with chicken wire attached and used zip ties to bind them together. 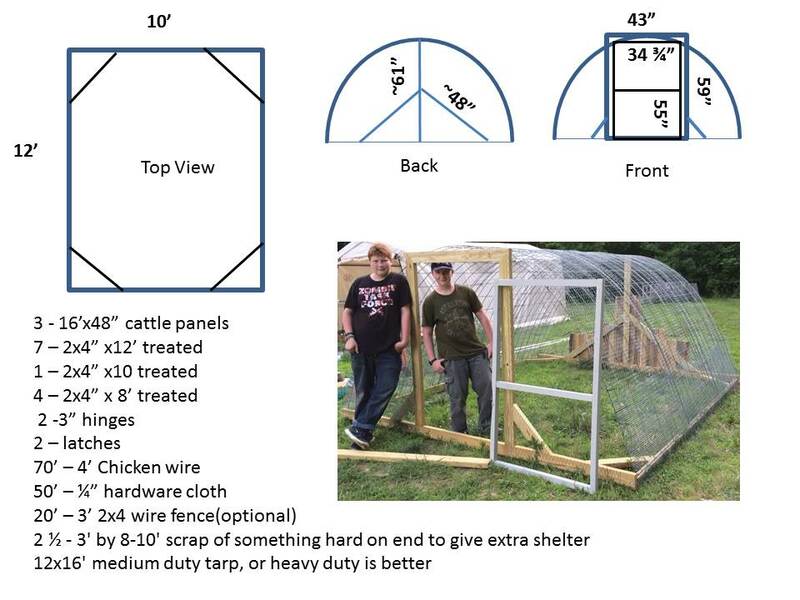 However, the panels were earmarked for my chicken tractor , were heavy to move, and expensive. I only use a couple leftover 8′ sections now. The rest of the fencing is step-in stakes and 36″ chicken wire attached to them at the bottom and on the top clip. So far it’s been enough to keep the birds in place. They get locked up at night, so I don’t need the fence to keep predators out. It’s fairly easy to move by un-clipping each stake and rolling up the chicken wire. Just to add a little narrative on how I build the chicken tractors. Start with the 10×12′ frame. The 10′ end pieces should raised slightly to help pull the tractor over clumps of grass. Add diagonal corner braces. Not sure that size matters. Hoop 2 sections of cattle panels. They will overlap slightly. Put in rear vertical and diagonal supports. Add something on the end bottom for additional shelter. This will go to the most windward side, west for me. Top is just covered by the tarp and can be raised for additional air flow. Cover the hoop with chicken wire, 3 passes of 4′. Overlap slightly. Cover the ends & door with chicken wire. Surround the perimeter with 2′ hardware cloth (optional). I do this to prevent predators from reaching in through the chicken wire and grabbing birds sleeping near the edge. Add 2×4 fencing to ends. This is added to ensure K-9 type/size predators cannot force through chicken wire. Cover 2/3 with tarp, wrap extra around back. The boys have been working on their tractor. Here are the plans.